Sept. 19 is International Talk Like A Pirate Day. For most would-be buccaneers, this is an opportunity to drink grog and try out their best Captain Jack Sparrow impersonations. Danger Room certainly does not discourage this kind of behavior. At the same time, piracy is not just a thing of the past, but rather a real-world problem plaguing the some of the most dangerous areas of the world today. 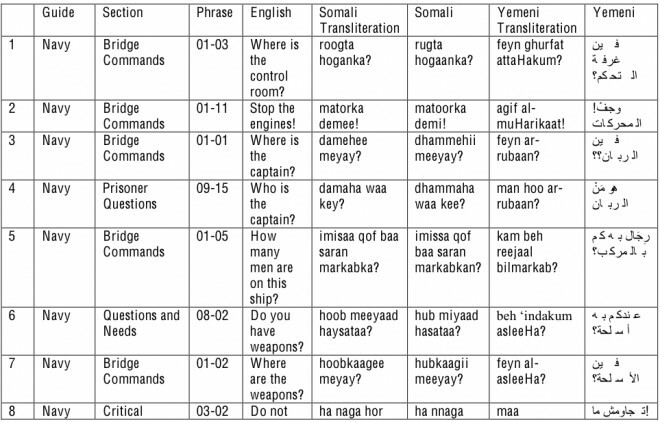 And so with this in mind but also in the spirit of International Talk Like A Pirate Day, Danger Room would like to offer this guide to talking like a real pirate — as in, the one of the guys hijacking ships in the Horn of Africa region today. It’s the first in what may become a series of ITLAPD features. 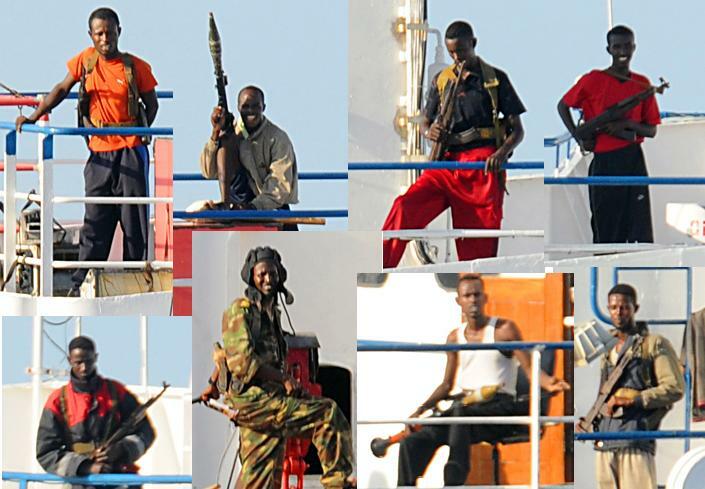 The Horn of Africa is without question the hotbed of piracy today. A quick glance at the International Maritime Bureau’s Piracy Reporting CentreLive Piracy Map shows a dense thicket of attacks, and even though some analysis indicates that the areas of attacks may be decreasing in size, and that the frequency of successful attacks is decreasing, the density of attack is increasing and the risk of attacks remains high. And the focus of this activity remains Somalia. What languages are these pirates saying? Based on the IMB’s reported risk zones, and country data for Somalia from the CIA’s World Factbook, they are probably speaking in Somali, Arabic (probably a Yemeni dialect), Italian (a vestige of Somalia’s colonial heritage) or English. But what exactly are they saying? 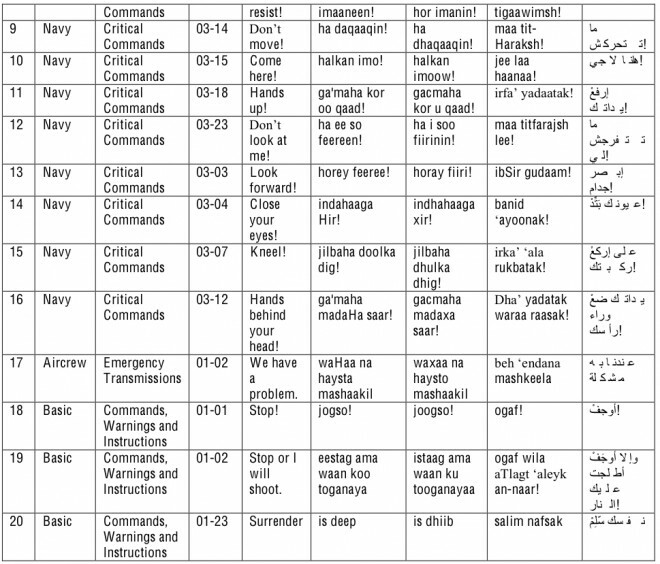 A good source for how to say something important in a combat situation at sea – and in a host of other interesting situations – are the Defense Language Institute’sField Support Modules for a given language. 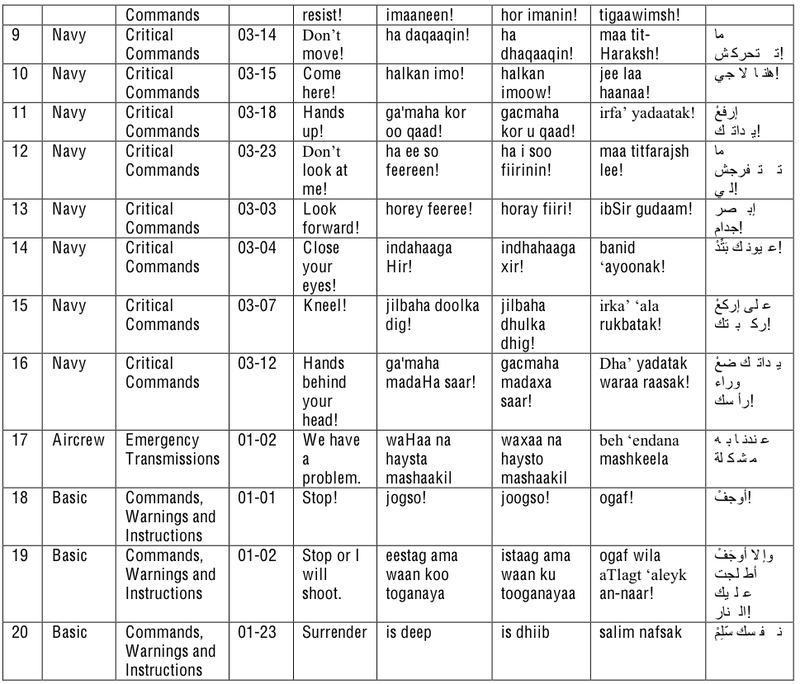 Sadly, Danger Room can’t help you out dealing with pirates on your next trip to Lake Como as DLI does not produce an Italian module, but below are 20 common pirate phrases in English, Somali, and Yemeni Arabic, along with where you can find them in the guides. Richard Wheeler is a designer, a writer, and an analyst. He likes maps. He likes pictures. He likes to figure out how things work.